Black Friday has come early to Society+! Now until November 27th, Society+ is giving 40% off to shoppers who join the S+ texting program! After you register online here, you will receive a coupon code via text to be used site wide! I've partnered with S+ to put together a wishlist of items that I'd love to purchase during this Black Friday Sale to help you get a jump on your Black Friday shopping! As a serious connoisseur of blanket scarves, this plaid addition is a much needed addition to my wardrobe. This scarf can be used as the focal point of a gorgeous outfit or can be dressed down with a pair of jeans and a grey turtle neck. 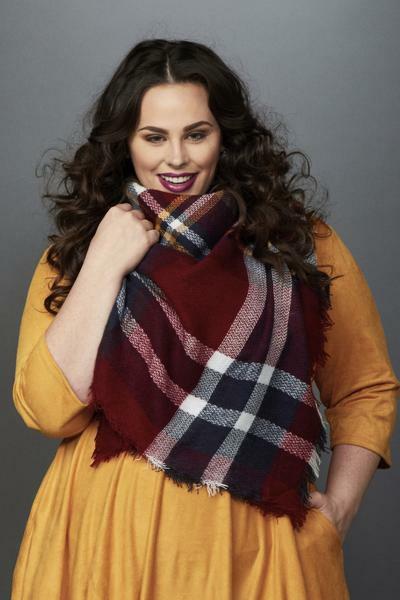 Which ever way you choose to style it, this oversized plaid scarf will keep you toasty during those cooler days! Continuing with the plaid theme, this cardigan is the perfect way to bring some of your spring and summer staples into the fall! Paired with your fav summer dress or caged crop top, this cardigan is a necessary layering item. I really love the elbow patch detail that gives a bit of a vintage collegiate feel that will add interest to any look! This pick is all about building the basics in your fall and winter wardrobe. A long sleeve top is a versatile piece to have during the cooler seasons as something to layer over. Throw those outdated fashion rules out the window and don't be afraid to shy away from horizontal stripes - this print creates dept and interest in any look! These great caramel colour is perfect for pairing with the wool coats and dark wash denim that are prevalent this season! Note - you may want to size up when purchasing this top as they do run small! Looking for the perfect Holiday dress? Look no further! This gorgeous emerald green dress creams luxury and is the perfect fit for all your Holiday party needs! The gorgeous damask fabric and fit and flare fit are super flattering and makes you feel like a million bucks, for quite the steal. I would pair this dress with a pair of strappy heels, embellished clutch and statement necklace to complete an "Oh yes, I'm always this fab" to blow my colleagues away! Who says you can't show some leg during fall? This plaid mini skirt had to make my list because of the gorgeous minimal print as well as the serious middle finger it gives to those fashion rules. Paired with cute booties, silk blouse and minimal necklace, this skirt will take your closet through to next spring!